For (an amazing) half century the classic Disney musical film Mary Poppins has entertained generations of audiences around the globe. This interesting back story on how this beloved movie got made takes us into the time period before its production where Walt Disney courted the tale’s stern author P. L. Travers into convincing her to sell him the rights. Her dislike of cartoons and silly musicals made this an uphill battle. Thompson and Hanks are great casting choices as Travers and Disney. The viewer is taken through the tiresome (often humorous) preparation of the screenplay with the feisty author, while flashbacks to her youth (and troubled father) shed light on her character and crucial elements found in the Mary Poppins story. Her trip to Hollywood has her interacting with the writers and composers, Mr Disney, and a lower profile (yet significant) driver. 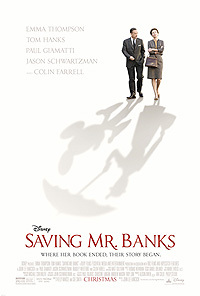 And who exactly is Mr. Banks and why does he need saving? For that you'll have to watch the movie (and then re-watch Mary Poppins, or if you haven't yet, enjoy it for the first time). This is a very cool real life biopic (more so for adults than kids) which can be seen as a very high budget feature length behind-the-scenes look. A great addition at the end of the film for the credits include actual audio recordings of Travers as they discuss specifics (illustrating how pedantic she was about getting the details right of the real places and experiences she worked into her story).